In brief: Good solid and tasty lunch today - we felt like we were crashing a man's establishment. We haven't to Rye House in a looong time, we almost forget it's around. Since our last visit, they've added a lunch special which for $16 gets you salad + soup + sandwich, which is really quite nice especially since they serve it in separate courses, but perhaps too much food for us from the looks of it. For the very masculine crowd, it may be perfect. 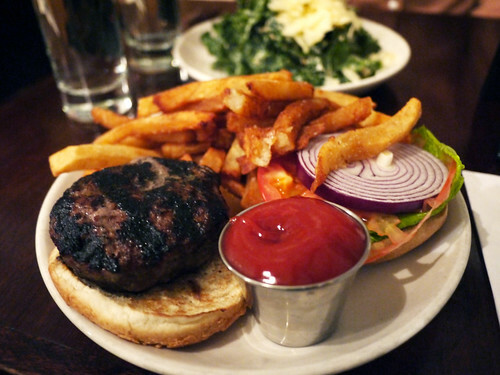 We shared a burger and salad, and both were very good verging on too salty, but enjoyable. The fries were also quite good. I guess we shouldn't wait another year and a half to pay a visit.